While many people consider chicken to be perfect for white wine, pairing it with a red wine sauce creates a lovely depth of flavor. The recipe below allows you to sauté the chicken and finish it in the oven. Once the chicken is cooked, you make a delicious red wine sauce from the pan drippings. Chicken breasts can dry out quickly if they are cooked incorrectly. This recipe uses a bone-in, skin-on chicken breast, and you cook the meat in such a way that it remains juicy and flavorful. For the wine, use a wine with single or blended Bordeaux varietals, such as a Merlot or Cabernet Sauvignon. These wines add plummy flavors to the dish. In a large, oven-proof sauté pan, heat the olive oil over medium-high heat until it shimmers. Season the chicken breasts liberally with salt and pepper. Add the chicken, skin side down. Leave the chicken in contact with the pan without touching it until the skin browns, about six minutes. Turn the chicken over and remove it from the stove. Transfer the pan to the preheated oven. Bake until the chicken reaches an internal temperature of 160 degrees Fahrenheit, about 25 minutes. Remove the pan from the oven. Remove the chicken from the pan and set it aside on a plate, tented with foil. Place the pan with the chicken drippings on the stove over medium-high heat. Carefully add the red wine to the pan, scraping any browned bits from the bottom of the pan with the side of the spoon. Use caution when adding alcohol to cooking food. Bring the mixture to a boil and then reduce the heat to medium-low. Simmer the wine and shallots, stirring occasionally, until it is reduced by half, about 10 minutes. Return any chicken juices that have collected on the plate. Whisk in the butter one piece at a time. Return the chicken to the pan, turning a few times to coat it with sauce. You can substitute a Pinot Noir, which brings earthiness, or a Grenache, which will impart smoky flavors to the dish. While you don't have to use expensive wine, you should use a wine that you would drink. Avoid cooking wines, which contain salt. Before putting the pan with the chicken in the oven, add eight ounces of sliced mushrooms to the pan and bake them with the chicken. Set the cooked mushrooms on the platter with the chicken and add them back to the sauce when you add the chicken. Replace the thyme with rosemary or tarragon. Replace the red wine with a dry white wine, such as Sauvignon Blanc or Chardonnay. For a sweeter sauce, replace the red wine with a tawny port wine or sherry. For a more acidic sauce, you can also replace the red wine with balsamic vinegar. If you prefer dark meat, replace the chicken breasts with thighs. Instead of browning the chicken in olive oil, add a smoky flavor by rendering the fat from two slices of bacon. Remove the bacon from the oil with a slotted spoon after it is browned and set it aside. Return the bacon to the pan when you add the chicken after the sauce is made. While you can serve this chicken as is with a simple salad, you can also serve it with multiple sides. 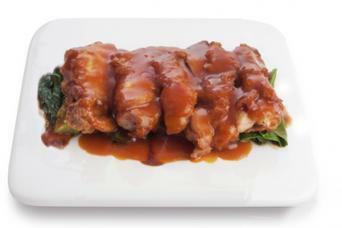 Serve the chicken and sauce over a grain such as white rice, brown rice, couscous, or quinoa. Keep the recipe low carb by serving the chicken with a steamed vegetable such as green beans, asparagus, or Brussels sprouts. Serve it with a root vegetable or tuber purée, such as celeriac, potato, sweet potato, or cauliflower. Spoon a little of the sauce over the top. Serve the entrée with the same wine that you used in the sauce for more cohesive flavor pairing. Chicken and red wine makes a flavorful combo. This simple recipe allows you to have a delicious entrée ready in less than an hour.